a long overdue heartfelt thankyou post. never having won anything in my life i was impossibly delighted when my name was pulled from josie’s hat in her anniversary draw at mr monkeysuit. 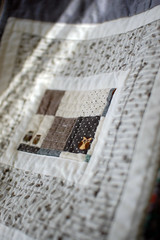 to have someone so talented make a baby quilt just for me (well, i suppose technically it was for baby G ;) ) was a dream come true. but that delight was nothing compared to how i felt when the quilt arrived, just a few days before G (note impeccable timing in contrast to my own belated effort). 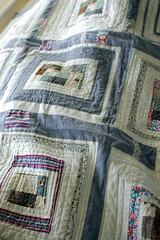 i posted briefly then but wanted to share more of the details of this wonderful quilt: the fabric choices, the pieced sashing, the softness of the backing, the wonderful spiralling square quilting. 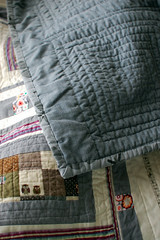 i was really blown away by the quilt and honoured to have won it. we use it every day and G loves it too. more pics.